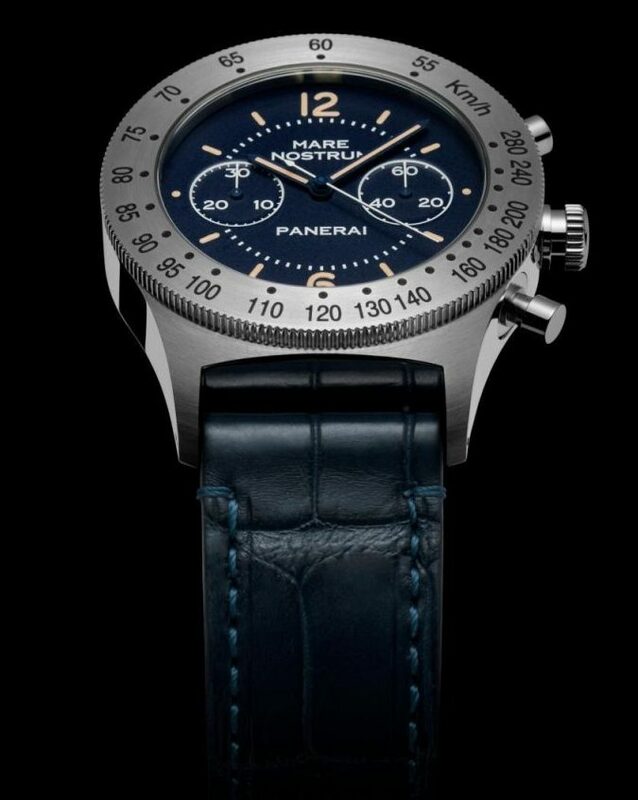 Panerai’s latest Mare Nostrum takes on a slimmer case profile. Perhaps realizing that the trend is shifting towards vintage homages, and a turn away from the gargantuan sizes, Panerai’s latest offering comes in a smaller 42mm. 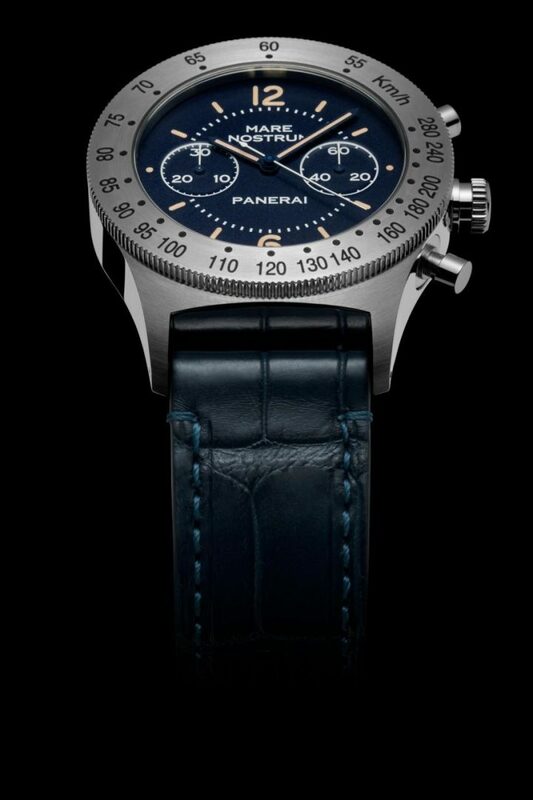 As is Panerai fashion, the watch is released as a special edition. It is a homage to the 1993 version, with a steel case with a 42 mm diameter and a blue dial. 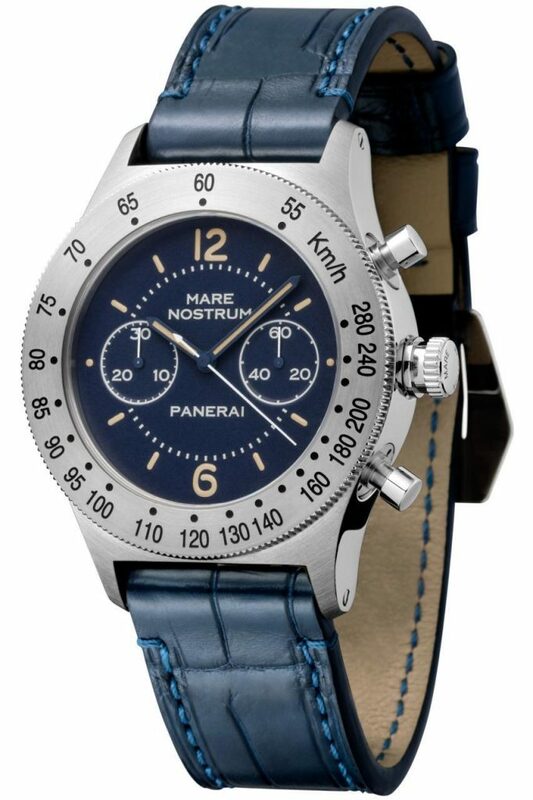 The Mare Nostrum was the first chronograph in the history of Officine Panerai. Its origins are somewhat mysterious: according to respected historians, the first prototypes appeared in 1943 and were intended for deck officers of the Royal Italian Navy, but they never went into production. 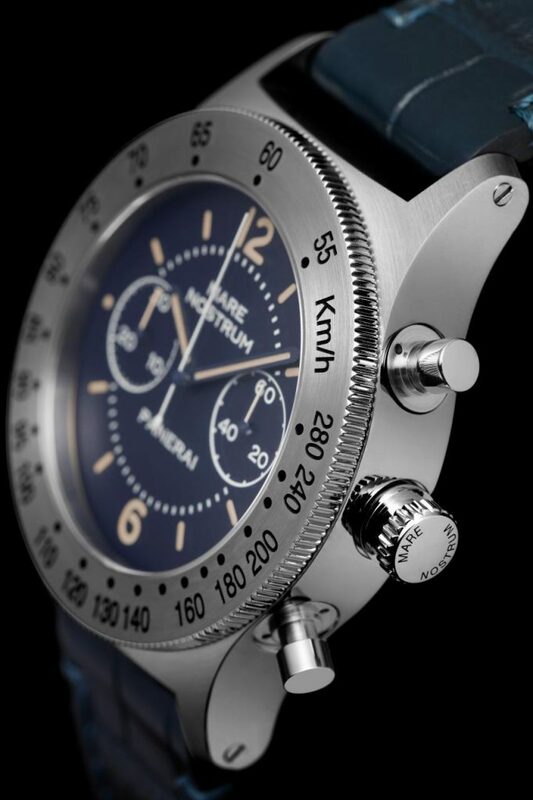 The Mare Nostrum 42 mm uses a closed caseback, which aptly fits the dive watch DNA. 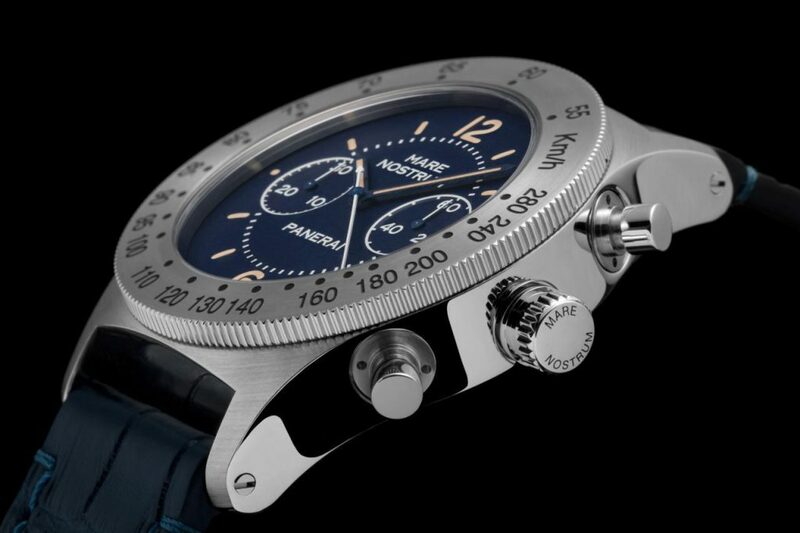 One of these prototypes was discovered and acquired for the collection of the Panerai Museum just a few years ago, enabling the appearance and functions of this model with its unique characteristics to be reconstructed accurately at last. 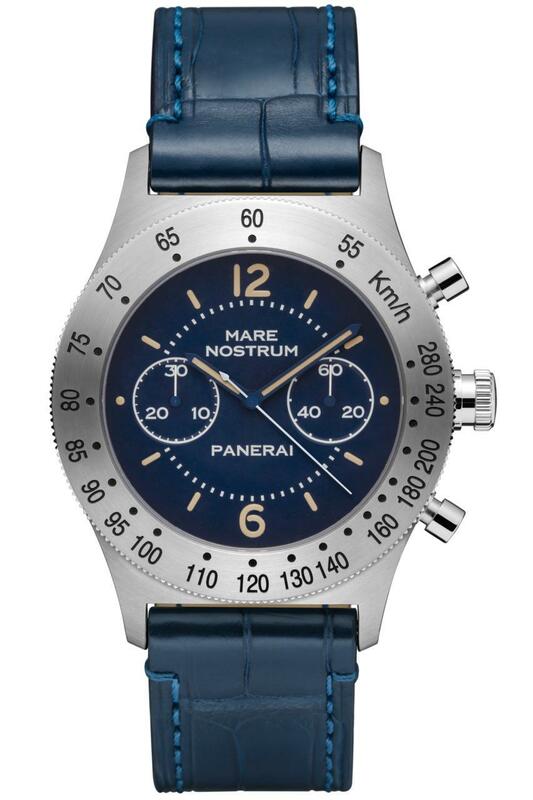 Until then, the Mare Nostrum had been known only through the limited documentation which survived the flood in Florence in 1966, and it was on the basis of this documentation that Panerai made a first re-edition of the chronograph in 1993 (Ref. 5218-301/A), the date of the first collection of Panerai watches made for civilian use and the start of the period known to enthusiasts as pre-Vendôme (1993-1997). The watch has a bezel groove similar to the 1950s Luminor bezels. The pump pushers and crown however, seem to have a life of its own. Distinctive to the Mare Nostrum line. The 1993 model, which inspired the new Mare Nostrum Acciaio – 42mm, had the same design and functions as its predecessor but it also had some differences, resulting from the desire to make the watch more portable, and also because of the lack of information available about the 1943 prototype. The AISI 316L stainless steel case was 42 mm in diameter instead of 52 mm, and it was fitted with a broad, flat brush-finished bezel engraved with the tachymeter scale in km/h. 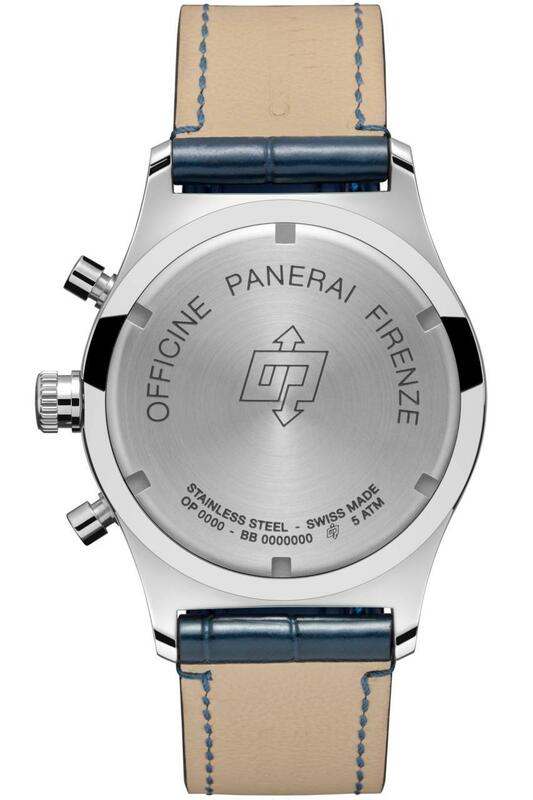 The two push-buttons controlling the chronograph functions were in traditional style and the screw back was personalised with the inscription Officine Panerai Firenze and the OP logo engraved upon it. Its water-resistance was 5 bars (about 50 metres), the same as that of the new Special Edition. The reduced case size, deep blue dial, intricate pushers and crown, and the lugs… could this be Panerai’s new hit? The dial of the new Mare Nostrum Acciaio – 42mm is a sophisticated deep blue, like the 1993 model, and it coordinates perfectly with the alligator strap, with matching stitching and a sewn-on steel buckle. The chronograph minute counter is at 9 o’clock while the small seconds dial is at 3 o’clock and the chronograph seconds hand is centrally mounted. The engraving on the dial and the markers coated with beige Super-LumiNova® ensure excellent legibility and follow the Panerai aesthetic which in this model, with its unique, distinctive characteristics, can be discerned on the closest inspection. The side profile of the Mare Nostrum Acciaio reveals a beautifully crafted tapered lugs design and a asymmetric pusher and crown layout. The new Mare Nostrum Acciaio – 42mm (PAM00716) uses the same movement as the pre-Vendôme model: the OP XXXIII calibre, created and personalised by Panerai on the ETA 2801-2 base with a Dubois-Dépraz chronograph module. With a diameter of 13 1⁄4 lignes, the hand-wound calibre has a power reserve of 42 hours and is C.O.S.C. certified. The watch uses a Dubois-Dépraz ETA 2801-2 based chronograph movement. Its thick bezel and case keeps true to the diver watch style. The box of this Special Edition of 1,000 units also contains a surprise for collectors, which recalls the vintage model. As in the pre-Vendôme period, inside the watch’s elegant wooden box is a little model of the Luigi Durand De La Penne, the destroyer of the Italian Navy launched in 1993. It was named in honour of Admiral Durand De La Penne, who in 1941 had taken part in the celebrated attacks in the port of Alexandria in Egypt for which he and other commandos equipped with Panerai instruments were awarded the Gold Medal for Valour. It was on the destroyer Luigi Durand De La Penne that the Mare Nostrum of 1993 was presented for the first time, on 10 September of that year. MOVEMENT Hand-wound mechanical, exclusive Panerai OP XXXIII calibre. FUNCTIONS Hours, minutes, small seconds, chronograph. CASE 42 mm, brushed steel. DIAL Blue with luminous markers and Arabic numerals. Minute counter at 9 o’clock, seconds at 3 o’clock, central chronograph seconds hand. WATER-RESISTANCE 5 bar (~50 metres).